I first learned of golden milk several years ago, while I was working with breast cancer survivors. The drink, now popular enough to find in many trendy coffee shops, is rooted in ancient Ayurvedic medicine and first used to strengthen vitality. The source of my introduction to golden milk was a patient who had trained as a holistic chef and incorporated the warm, spiced beverage into her daily wellness routine. She helped me put together a recipe that could be shared with other cancer survivors who were eager to take advantage of the drink’s many benefits. 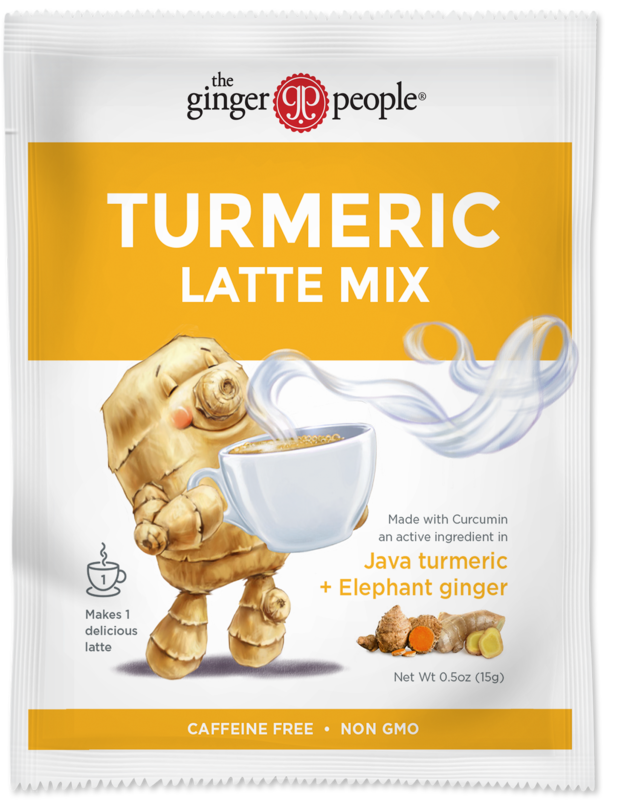 With The Ginger People’s new Turmeric Latte Mix, you can get the benefits of golden milk without the hassle of purchasing and blending various spices together. The mixture, which comes in a powdered form to be combined with a milk of choice, is a blend of spices and includes Arenga palm sugar for a light sweetness and better glycemic control than table sugar. Despite being called a “latte,” the drink is not caffeinated, which makes it a lovely evening elixir and delicious alternative to coffee any time of the day. The primary ingredient and “superfood” of the mix is turmeric, a member of the ginger family, boasting a number of health promoting properties. The specific type of turmeric used in The Ginger People® spice blend is Java turmeric, which has a particularly rich Curcumin concentration. Curcumin has been well researched in the medical community, especially for its anti-cancer and anti-inflammatory benefits. Additionally, unique to Java turmeric is a compound called Xanthorrhizol, which is less well known than Curcumin but has demonstrated anti-cancer, antimicrobial, anti-inflammatory and antioxidant properties in studies. Xanthorrizol acts independently and synergistically with Curcumin to aid in health issues. In a laboratory setting, Curcumin has demonstrated strong cancer preventive qualities as well as the ability to actually stop the replication of tumor cells, without negatively impacting surrounding healthy cells. In cancer patients, Curcumin has been well tolerated with no toxic side effects, reduces uncomfortable symptoms of cancer, and in some small trials, has even shown reductions in tumor progression. However, much more research is needed in this area before any strong conclusions can be made. We always encourage speaking with a physician before making dietary changes, especially if one is taking medications that have the potential for dietary interference. The most obvious way to enjoy the Turmeric Latte Mix is by combining it with a warm milk of choice and a pinch of black pepper to increase bioavailability of Curcumin. In this context, I encourage non-dairy milks such as almond or coconut to allow for better nutrient absorption of the polyphenols (plant compounds with antioxidant properties). The mix can also be used beyond the standard directions. Mix with hot cereal, such as oatmeal or buckwheat porridge, to add flavor. Sprinkle on top of cubed sweet potatoes before roasting to eat as a dinner side or even dessert. I’m currently on a “nice cream” kick, and have loved adding it to pureed frozen bananas, as a sweet treat.